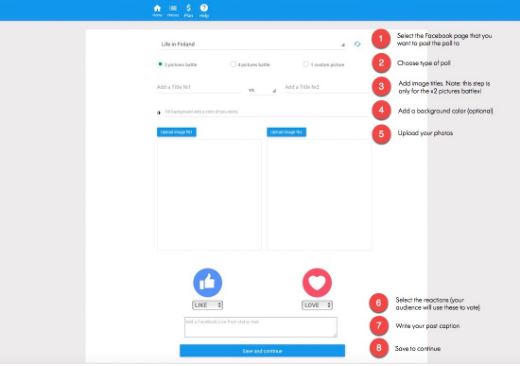 Today I would love to share with you a detailed instruction on how to create a Facebook Live poll video with Video React. You probably have noticed that Facebook Live poll videos are the hottest trend right now; you could say that they have swept through the social media marketing community like a tidal wave. I know that many marketers would love to try this new format on their pages but don’t know how to create it. You might already have seen a bunch of complicated tutorials on the internet that perhaps pushed you off from even trying. But no need to despair! 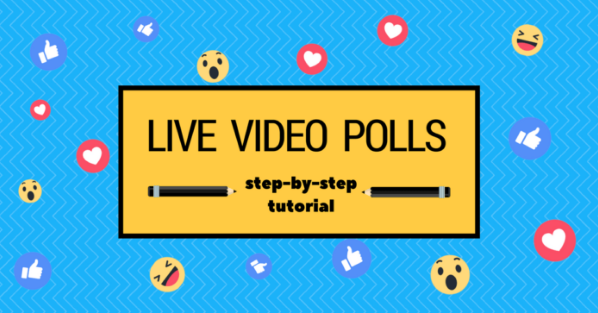 In this article, I will show you how to create a Facebook Live poll video in just about 15 minutes without any programming skills or special technical knowledge. LATEST UPDATE Dear friends, the service I mention in this article doesn’t work anymore. I recommend you to use GoUpLIVE instead. It is even easier to use and they have more interesting interactive video templates. On top of that, they stream your live polls from their servers, so you don’t need to do it from your computer anymore. If you would like to learn more about the templates offered by UpLIVE. Facebook Live poll: what is this? A short introduction for those of you, who haven’t heard about Facebook Live polls before. Basically, Facebook Live poll is a simple video consisting of the following elements: 1) a question, 2) two or four images representing answer options, 3) the reactions a user is supposed to use and 4) vote counters that are updated in real time. This is the Live poll from where it all started: Clinton vs Trump. It got more than 19 million views, 437,000+ reactions and more than 15,000 shares. Why are Facebook Live poll videos more efficient than normal page posts? First of all, Facebook tends to push Live videos higher in the Newsfeed. Live videos get an extra organic boost from the algorithm while they are live. After that, a live video is treated as a normal video post which also gets a good organic reach. In case you didn’t know, Facebook spent hundreds of millions of dollars to promote Live events. So, it goes without saying, that Facebook is right now trying to encourage people to use this feature. Secondly, Facebook live polls are a new cool feature and people love all things shiny and new. Live polls stand out in people’s feeds and attract more attention. For this reason, now is the best time to jump on the live poll train. You want to be one of the first ones, rather than last, to use this new feature. This way you get the best results. UPDATE: Hey guys! I have recently found a new cool tool called UpLive. They have some unique Facebook LIVE video templates that I haven’t seen any other services offering. I personally love their Reveal template as it works just great. If you are interested, check them out. 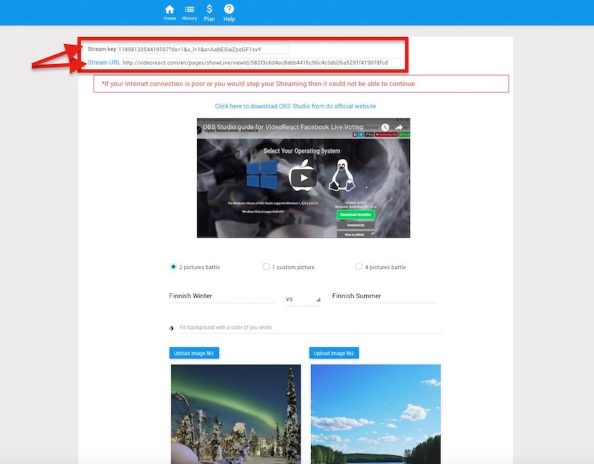 I also have a new article with in-depth description of all their templates and how you can use them to promote your Facebook page. In this tutorial we will create a quick and easy live poll with the help of a service called Video React. Note: this isn’t a free service but it is definitely worth every cent. It will save you a lot of precious time and, most importantly, your nerves. I have already created several Facebook Live polls with Video React and I absolutely love it. It took me literally some 15 minutes to create my first poll and even less for the next ones. You don’t have to deal with any HTML-templates. 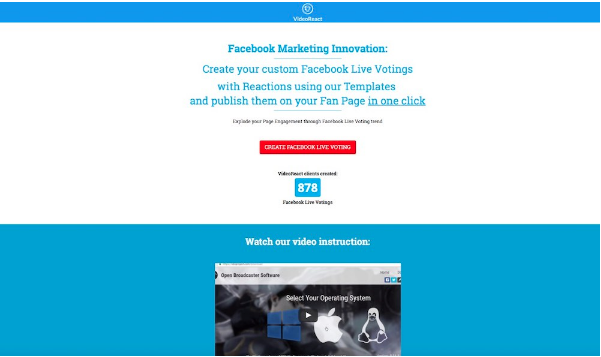 You won’t even need to create a Live event on Facebook; Video React will do the whole job for you. a poll with one photo and the same two reactions ( & ). You might want to use this one if you want to create your own image with special fonts or your branding. I use Canva to create an image for this type of poll. a poll with four photos and four different reactions. NEW FEATURE: a poll with a question and four horizontal lines where the amount of votes is displayed. I really love this poll type. I have seen one major Facebook page using a poll like this to compare footballers (the European kind ). I think this template is great for encouraging audience to vote for their favourite celebrities, foods, drinks, flavours, clothing items and so on. You can see each type displayed in the picture below. click the «Start streaming» button. That’s it! It’s that simple! No programming or technical knowledge needed! 1. Sign up for Video React. Go to Video React’s website. Click on the red button «Create Facebook Live Voting». Give the application permission to have access to your Facebook pages and to post on them.Click «OK». Don’t switch off any of the permissions because otherwise the app won’t be able to do the job for you. It needs access to your pages and the permission to post since it will actually post your Live poll to your page in one click. In this step we will work on the Facebook post that your audience will see. First, from the dropdown list, select the page on which your poll will be posted. 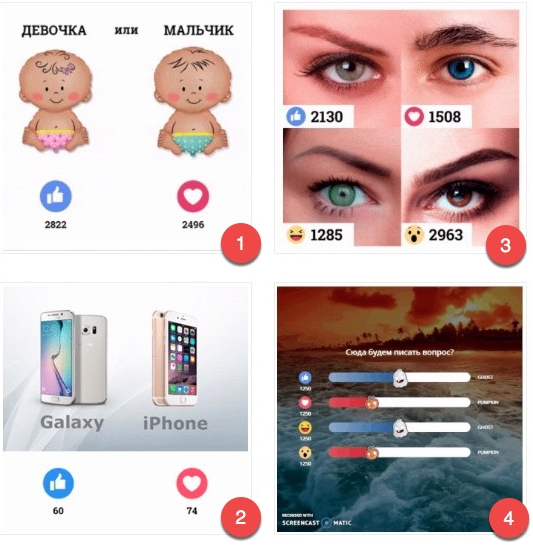 Next, choose the poll format you want to use: 1 or 2 images with two Facebook reactions or 4 photos with four different reactions. If you decided to use the 2 photos option, add a title to each photo. Also, you can choose either «or» or «vs». This will be displayed between titles. If you wish, you can add a color background (optional) that will appear behind the two photos. Select the Facebook reactions that you would like to use in your poll. These are trackable reactions and their count will be displayed on the video in real time. And finally, write your post caption. Remember to include the question you want to ask your audience; they should have a clear call-to-action to act upon. Don’t make the caption too long. This will only distract your audience from the poll. Save your poll post to continue. When you click on the «Save» button, you will be asked to choose a payment plan. or a life time subscription for unlimited polls for unlimited Facebook pages. For the time being you can only pay with PayPal. However, I believe that there will be more payment options in the future. Once you have paid for the service, you will get back to the post design page. Click on the «Save» button once again. Now we have come to an important step. 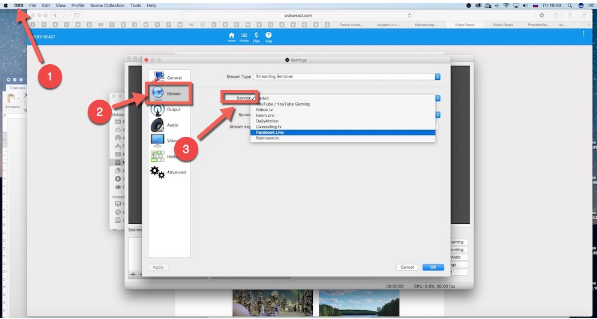 Video React will automatically generate a «Stream Key» and «Stream URL» for you. You will need to enter the key and the URL into the OBS Studio software. I will show you how to do it in the following steps. IMPORTANT! Keep the Stream Key a secret. Anyone who gets access to your key will be able to stream video to your post. The stream key is valid for 7 days. Open a new browser tab. Download and install OBS Studio. 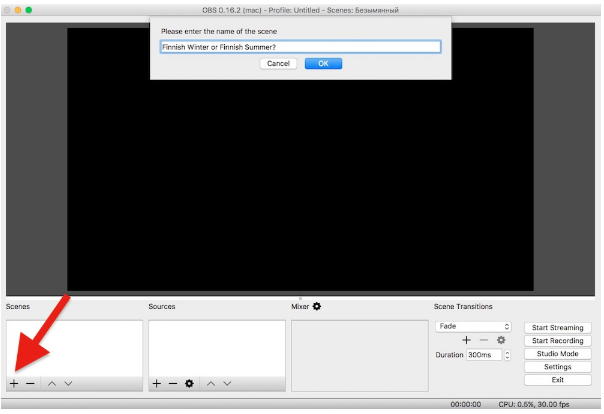 OBS Studio is a free open source software for video recording and live streaming. 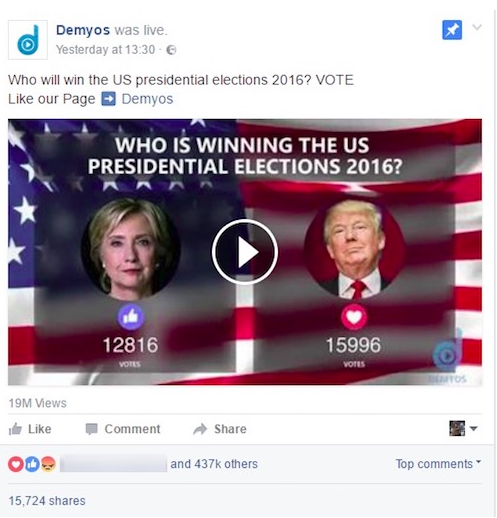 We need it in order to be able to show the reactions vote count in real time in our Facebook Live video. 2. Go to the program «Preferences», then choose the «Stream» tab as shown on the screenshot below. Then, choose «Facebook Live» in the field called «Stream». 3. Go to your Video React tab. There you should see a field called «Stream key». Copy the key and paste it into OBS Studio, in the field (that also is) named «Stream key». 4. Next, in OBS Studio, go to the «Video» tab and set the video resolution to 768×768. Do it in both fields: «Base Resolution» and «Output Resolution». Save the changes by clicking «OK». IMPORTANT! Type in the resolution numbers manually, don’t copy and paste. When I first tried to copy/paste the numbers, my computer couldn’t save them. This resulted in an incorrect video output, so, please, pay attention to this step. 5. Now, go to the «Audio» tab and make sure that you have totally disabled all the audio output. See the example below. Save the changes by clicking «OK». 6. 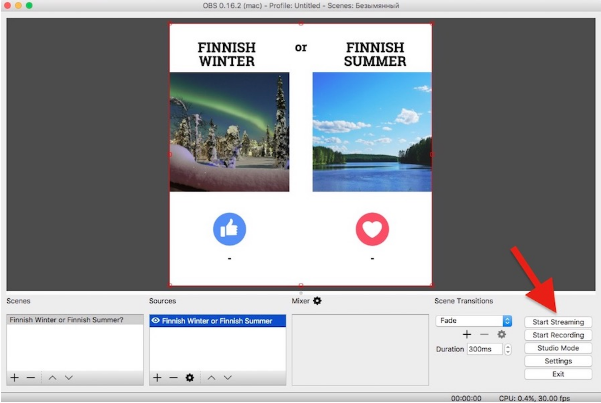 In the section called «Scenes», create a new scene by pressing «+» (see picture below, lower left corner). Give your scene a name, for example, the name of your poll. It doesn’t really matter what name you give. You can leave the default name, if you wish. Press «OK» to save the changes. 7. In the section called «Sources», click on the «+» (see picture below)and select the option «BrowserSource». Give the source a name or just leave the default name. Press «OK» to save the changes. 8. In the pop-up window (see picture below), delete the link in the URL field. Go back to your Video React tab. There you should see a field called «Stream URL». 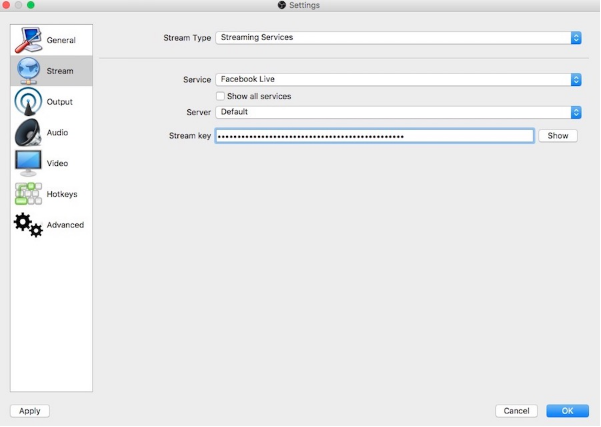 Copy the key and paste it into OBS Studio, in the field (that also is) named «Stream URL». Next, in the fields «Width» and «High» enter the resolution 768 and 768; otherwise the picture will not be displayed correctly. Save the changes by clicking on the button «OK». 9. Well done! We are almost there and ready to launch our first Facebook Live video poll. Before you post your poll, please check that your video is being displayed correctly. Look at the example below. Your image should be surrounded by a grey area. Only the area inside of the red lines will be visible to Facebook users. If you happen to see a black area around your video image, go back to the steps #4 and #5/4 in this section and make sure that the video resolution is set to 768 x 768. 8. If everything is fine and you are ready to go, press the button «Start Streaming». IMPORTANT! When you press on «Start Streaming», your Live poll will be automatically published on your Facebook page. Once you have pushed your video live, monitor that everything goes according to plan. The most important thing is that you keep your OBS Studio window open during the whole streaming time! This is crucial because your audience will see what is displayed in this window. If your computer freezes or shuts down, your streaming will go offline. How to increase the reach of your Facebook Live poll? Pin your Facebook live poll to the top of your page to gain as much exposure as possible. Share the poll on your personal timeline to give the post the first boost. If you have colleagues, partners or employees, ask them to share the post as well. Share the poll in relevant Facebook groups to further increase the reach. Embed the live streaming poll to your website or blog. If you have newsletter subscribers, send them an email with a kind invitation to vote. Remember to include the link to your poll I highly recommend to prepare the newsletter in advance — Facebook allows maximum 4 hours of streaming. Promote the link to your live poll on other social media channels. In order to run a Facebook Live streaming event, you need a high speed internet connection and a good computer! If your internet is turned off or your computer freezes, your live poll will go offline as well. The maximum duration of the live video on Facebook is 4 hours. Make sure that you can be around your computer all this time. OBS Studio must be open during the entire streaming time. You can use your computer, but do not close the streaming window. You can run one streaming at a time. This means that you cannot run simultaneously two or more live polls on the same computer. I hope this information will help you create and run a successful Facebook Live Poll! I’ll be glad to hear from you in the comments section below.